surely I’m not alone … ? 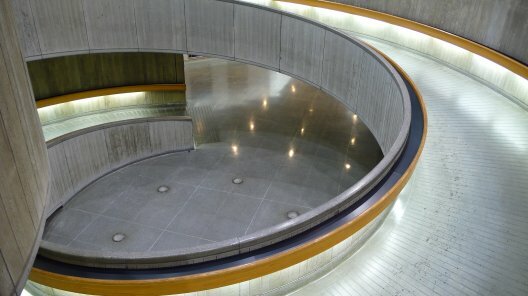 Ottawa VIA Rail station has a circular spiral ramp that leads down from the concourse to the platform level. 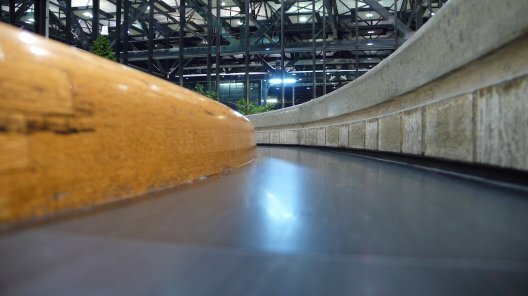 It has a smooth channel for a handrail which looks perfect for racing marbles or toy cars down. Surely I’m not the only person who has ever wanted to do this? It looks so inviting! Author scrussPosted on 02007-11-09 Categories goatee-stroking musing, or somethingTags geek, marble, ottawa, station2 Comments on surely I’m not alone … ? These are simple three-column CSV files, stating latitude, longitude, and station name. They should be in order of stations. Locations are probably within about 50m of real life, but don’t bank on it. I’ll get these into more useful formats soon, like GPX and KML. For now though, if you can use ’em, go ahead and do something. For a truly soulless evening, take yourself down to the BestBuy at Scarborough Town Centre. STC is a mega-mall, with the obligatory huge concrete and asphalt deadzone around it. Its current sales slogan is For what defines you, which must mean that its denizens are in a pretty parlous state, existentially speaking. Its only slightly attractive feature is its derelict KrispyKreme store, which opened as a flagship, then frazzled almost as quickly as a KK’s dextrose rush. Abandoned donut shops are Canada’s ruined abbeys; places of worship gone to seed. BestBuy itself is an outcast from the mall, in an especially ped-unfriendly way. Perhaps the only defined route there is through a monster split-level Wal-Mart, but I didn’t have enough hitpoints to make it through that particular slough. I’d checked their website, and it said that the store had iBooks in stock, at $50 below retail. Did the store have any on display? No. The Apple section was set behind the customer service desk, which was a scrum of slightly disgruntled shoppers. So I left without seeing one. I wandered in a bit of a post big-box haze to McCowan RT, a weird little station at the very end of the rails. At least I was rewarded with a beautiful sunset over the 401 at McCowan; all boiling red and purple. That’s about the best you’ll get near STC, and for free, too.